Düsterloh pneumatic starters are used to start up diesel engines and turbines. They mainly comprise a toothed wheel motor, a single-track pinion with reduction gear and a valve combination. Since the toothed wheel motor develops its greatest torque when breaking out, it is particularly suitable for starting diesel engines. 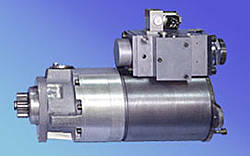 Düsterloh pneumatic starters can be operated using air or gas. They are independent of electrical energy systems, maintenance-free and explosion-safe. Their reliable operating behaviour guarantees safe starting of the diesel engine even under extreme environmental conditions, i.e. they can even be used for applications in the tropics, in the Arctic circle, in deserts or off-shore.